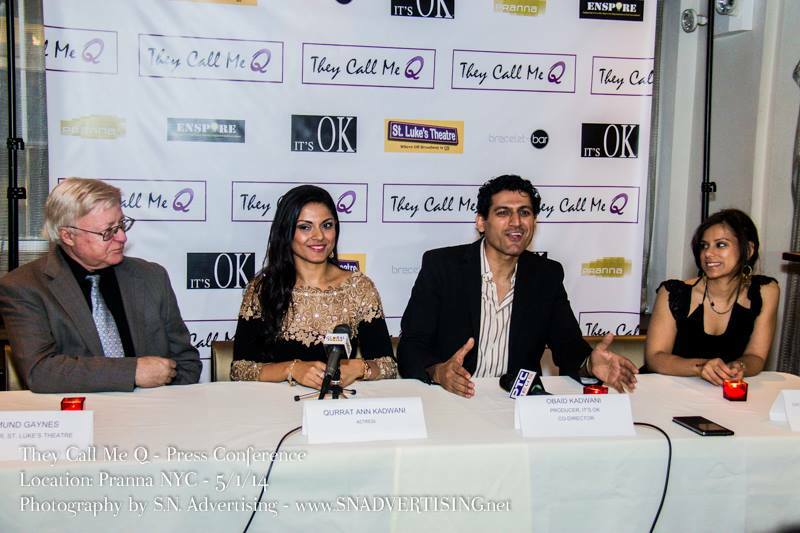 A press conference and launch party for the upcoming Off-Broadway premiere of THEY CALL ME Qis set for this Thursday, May 1st 6:30pm at Pranna Restaurant, 79 Madison Avenue (at 28th St.) The shows Author/Star, Qurrat Ann Kadwani, will appear at the event along with Producer / Co-director and TV personality, Obaid Kadwani and Co-Director Claudia Gaspar. Joining them will be Edmund Gaynes, producer and owner of St Lukes Theatre. 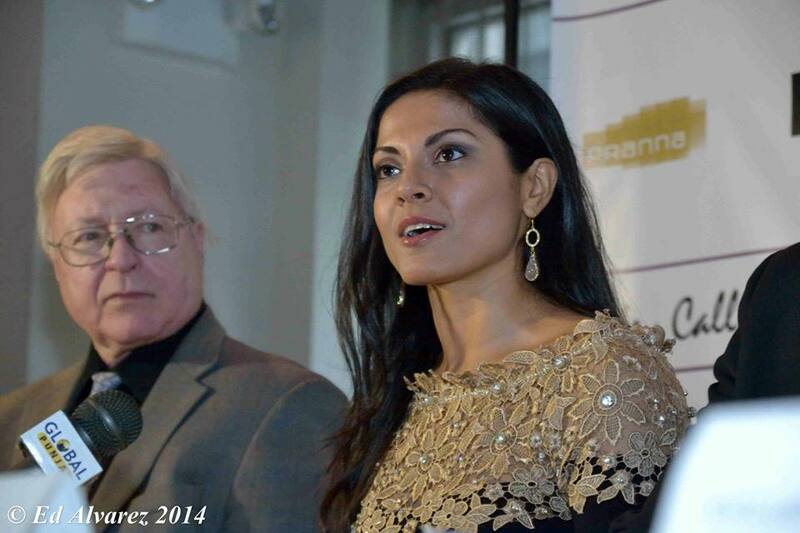 Sponsor Shahnaaz Islam of Bracelet Bar will also be in attendance. 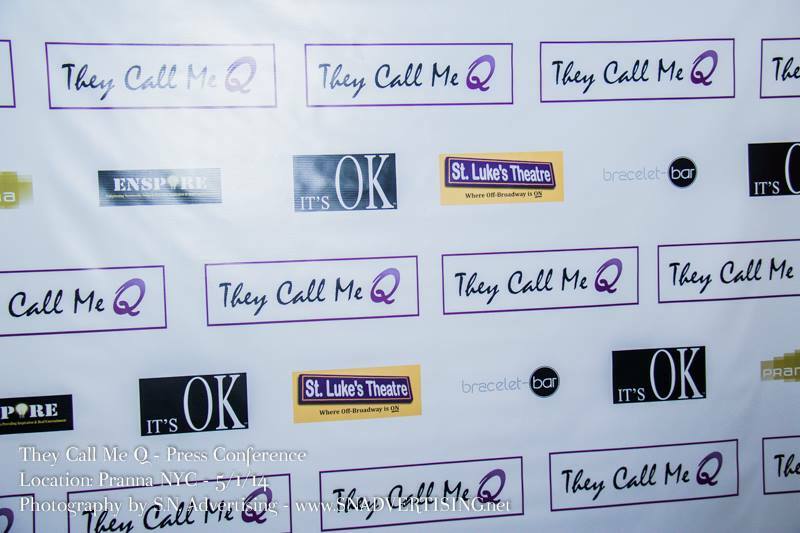 The award-winning play THEY CALL ME Qwill begin performances May 19th at St. Lukes Theatre in the heart of the Theatre District. 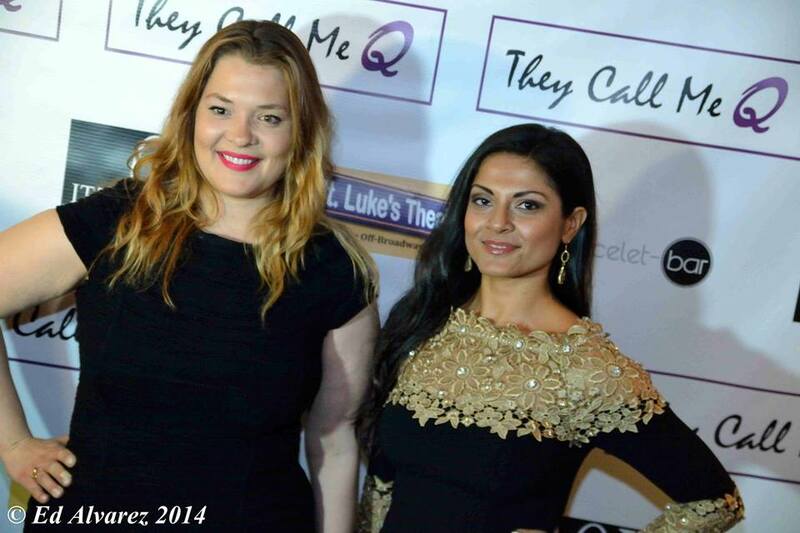 "Qurrat Ann Kadwani is a theatrical force of nature!" 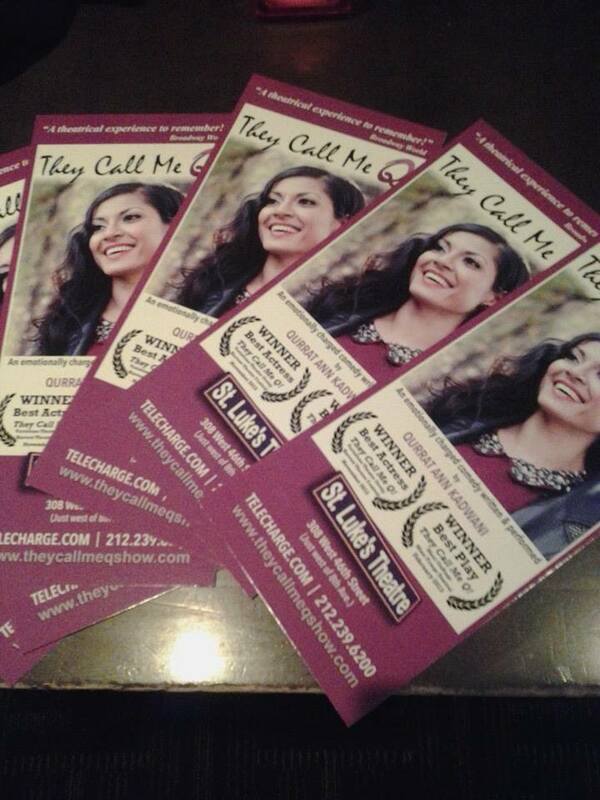 “A jazzy gem, in the ranks of John Leguizamo, Spalding Gray & Camryn Manheim!" THEY CALL ME Q is the story of a girl from Bombay growing up in the Boogie Down Bronx who gracefully seeks balance between the cultural pressures brought forth by her traditional parents and wanting acceptance into her new culture. Along the journey, Qurrat Ann Kadwani transforms into 13 characters that have shaped her life including her parents, Caucasian teachers, Puerto Rican classmates, and African-American friends. 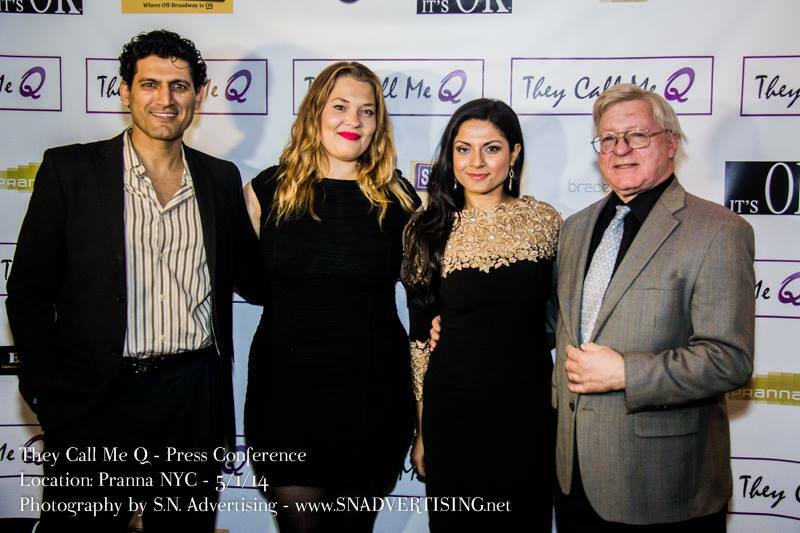 Laden with heart and abundant humor, THEY CALL ME Qspeaks to the universal search for identity experienced by immigrants of all nationalities. Under the direction of Obaid Kadwani and Claudia Gaspar, and developed with Ellery Schaar, THEY CALL ME Qscored the Best Actress Award for Ms. Kadwani in the productions debut at Variations Theatre Groups 2012 Harvest Theatre Festival. The emotionally charged comedy subsequently opened to rave reviews in cities all around the country and Canada including Chicago, Montreal, Washington D.C., Nashville, Orlando, and even Hawaii where THEY CALL ME Qwas awarded Best Play at the 2013 Maui Fringe Festival. Qurrat Ann Kadwani is an actress, producer, television host, and philanthropist.She has hosted Desi Jams and 100% Desi on Namaste America, and her other TVappearances include ABC News What Would You Do?, As the World Turns and All My Children. Ms. Kadwanis stage credits include Blind Angels (Theatre for the New City); Sankalpan, First Language (New Group); Inside Out, The Quaking (Abingdon Theatre Company); Falling Man (NYU); The Greeks (Imua Theatre Company); Baby Taj (TheaterWorks Palo Alto); Perfect Fit, The Women of the Mahabharata, Beneath the Banyan Tree (eyeBLINK). This past December, United Nations UNICEF invited her to perform. 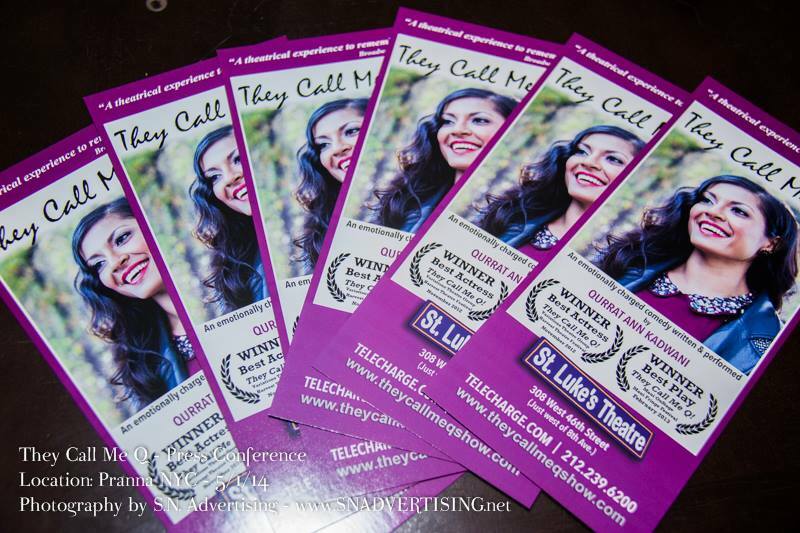 Non-profit charity organizations such as Sankara Eye Foundation, Lend-A-Hand India and Sapna NYC have also presented the play as benefit fundraisers. Obaid Kadwani, co-producer and co-director of THEY CALL ME Q, is an entrepreneur whowears many hats including producer, director, author, actor, andcharity activist.He isthehead of It’s OK Films and the author of the upcoming book A Slice of Hope.Obaid is the co-founder of Working Actor Studio, an acting school in NYC, and he founded the charity project A Slice of Hope, which raises joy and optimism in homeless shelters. 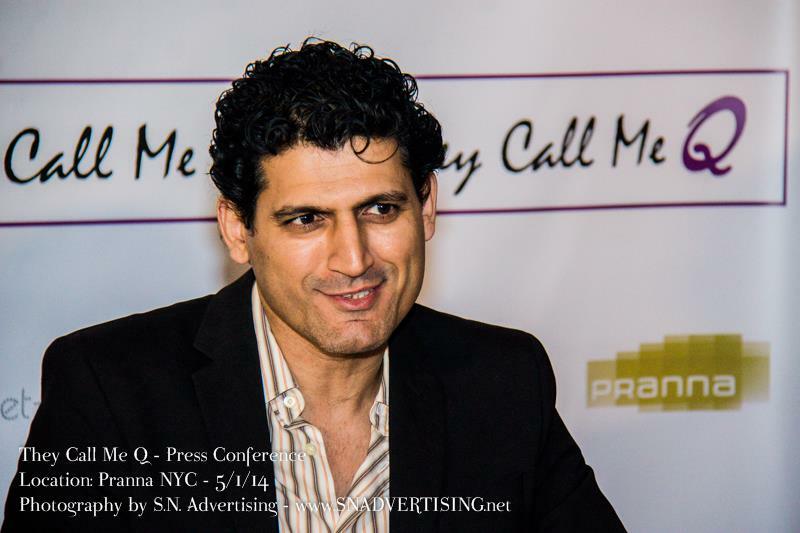 Hehas acted in Bollywood films including New York and Badmaash Company as well as American TV shows including The Blacklist.He also hosts TV shows and anchors the weekly news desk for Namaste America. THEY CALL ME Q will be performed Mondays at 7pm and Wednesdays at 8pm at St. Lukes Theatre, 308 West 46th Street (just west of Eighth Ave.) Tickets are available through www.Telecharge.com or by calling 212-239-6200.